Students from the Wolff Center for Entrepreneurship will take over Butler Plaza for three days during the annual Wolffest competition April 8-10. Students from the Cyvia and Melvyn Wolff Center for Entrepreneurship at the C. T. Bauer College of Business will put their startup skills to the test April 8-10 during the program’s annual Wolffest, an event that challenges teams to create food stands on campus and compete to earn the most revenue and execute the most successful business plan. 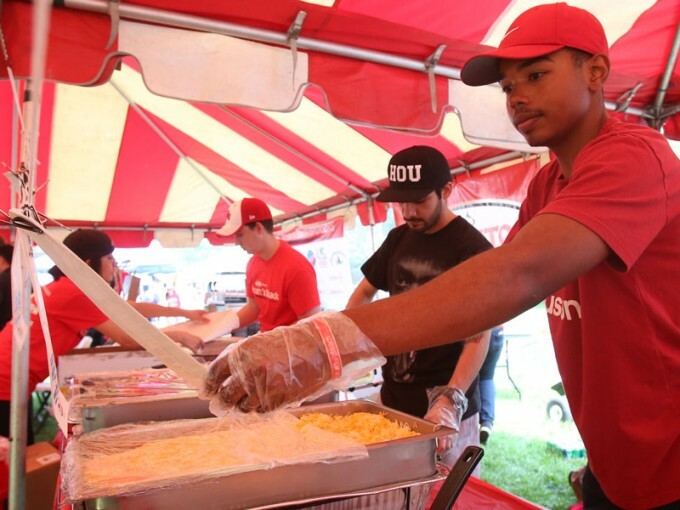 Wolffest challenges students’ creativity, business aptitude, teamwork and entrepreneurship acumen, serving as both an experiential learning opportunity and the largest fundraiser the senior class will hold this year. Glenn Figueroa is an entrepreneurship senior leading “Team Duality,” one of the Wolffest teams. As CEO, Figueroa said he and his teammates have been preparing for Wolffest for several months and have already gained experience from it. During Wolffest, students experience the many challenges of starting a business, from the difficulties of organizing, researching and cost modeling, to evaluating their own business’ successes and failures. Students also learn how to work in teams and keep “employees” motivated. The event is centered on food for the patrons, but the student participants aim to put entrepreneurship in action. This year’s competition will be the biggest yet, with eight teams competing. The program uses Wolffest to celebrate entrepreneurship throughout the University of Houston and the community it serves, WCE Associate Director Ken Jones said. “Each team must learn to work as a coordinated unit, raise financing, determine a theme and brand, schedule their workforce, align with regulations, determine their finished product, set pricing, control cash and secure customers. The team exercise forces coordination of disparaging schedules, identification of strengths and weaknesses and goal setting,” Jones said. For more information about Wolffest, click here.